How the Heck Did Elf on the Shelf Get Started? Elf on the shelf is a popular Christmas tradition where a special scout is believed by children to be sent to their home from the North Pole. This tradition “encourages” kids to behave themselves with the idea that Santa’s little helper watches them every day, and each night, he or she will return to North Pole to report if the children were naughty or nice. There are two rules that come with this Christmas tradition. The first rule is that the children are not allowed to touch the elf or its magic will be gone. But if it is touched by mistake, children should write a letter to Santa to apologize then sprinkle a little cinnamon beside the elf before going to bed.The second rule is that the elf will not speak or move while the children are awake. It only moves at night when he makes his trip back to the North Pole and once it returns home, it will then assume a new position in the house. One has to wonder a bit about these “traditions” – so we tell our kids a non-moving little creature is watching over them all the time and they better be good? Doesn’t that seem a little overlordish and disingenuous? Then again – if keeps the little rug rats in line maybe it’s worth it? Or is it just another ploy to get parents to spend a few more bucks during the holidays?So how exactly did this interesting new “tradition” get started? Well, it does not have an exact arrival date on when the tradition started but it was popularized by Carol Aebersold and her daughter Chanda Bell’s picture book titled“The Elf on the Shelf: A Christmas Tradition”. 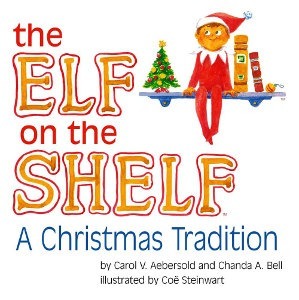 The picture book, “The Elf on the Shelf: A Christmas Tradition”, was written by Carol Aebersold and daughter Chanda Bell over a cup of tea in 2004. It was Bell who suggested that they write a book about their old family tradition which started in the 1970s. It is about an elf sent from Santa who came to watch over them every year after Thanksgiving to keep an eye on the children and prevent them from misbehaving. They also recruited Aebersold’s other daughter, Christa Pitts, to share her expertise in sales and marketing. The three devoted the next three years promoting their self-published book. In 2008, The Elf on the Shelf won the Best Toy Award by Learning Express, the Book of the Year Award from Creative Child Awards, and as well as the National Best Books Award by the USA Book News. It made its first appearance in the Macy’s Thanksgiving Day Parade in 2012 together with fellow parade newcomers Papa Smurf and Hello Kitty. It then hit the number one spot on the USA Today Bestsellers List in 2013. The book became a 30-minute animated TV show on November 26, 2011 and it aired on CBS with the title, “An Elf’s Story: The Elf on the Shelf”, directed by Chad Eikhoff. Then, in October 2013, “The Elf on the Shelf: A Birthday Tradition” picture book was released. It was written and illustrated by the same team who created the first book. As stated earlier, the duty of Santa’s scout elves is to hide in people’s homes to watch over events, especially children. Once everyone’s asleep, the scout elf will fly back to the North Pole to report to Santa the activities and events that happened through the day whether good or bad. Before the family wakes up, the scout elf will return home and hide in a new spot around the house. It is like playing an ongoing game of hide and seek with the family. Based on the picture book, the scout elves get their magic by being named and being loved by a child. On each book, you can write your elf’s name at the back and the date that you adopted it. Once it has been named, the scout elf will receive its special Christmas magic, allowing it to fly to and from the North Pole. But always remember the rule, do not touch it or its magic will be gone. The story of the Elf on the Shelf ends on Christmas Day, saying that the scout elf will leave to stay with Santa for the rest of the year until the following Christmas season. The Elf also received some criticism from cultural viewers. Some says it’s a marketing juggernaut dressed up as a tradition. And for others, it somehow conditions kids to accept the surveillance state and communicates to them that it’s okay for other people to spy on you. But on the brighter side of things, the Elf on the Shelf is just one fun Christmas tradition that the whole family can enjoy. The Elf on the Shelf is still fairly new especially to those of us that were not children of the new millennium, but there are lots of photos and ideas you can find online about this watchful elf. There are also some hilarious meme’s about what the elf really does when not seen.